Every conceivable size and colour is represented in the unsightly heap – black, brown, green, square, round, shiny, matt and cracked. I’ve tried organising the pile into neat stacks, but they never quite fit – and really, life’s too short to stack flowerpots. While I can reuse some of the pots for seedlings and cuttings, I’ve got far more than I need, and recycling options near me are extremely limited. And so the mountain grows and grows. Plastic flowerpots are one of the ignored environmental burdens of our times. An incredible 500 million of them are in circulation every year, and most local authorities won’t recycle them (they’re made from a different type of plastic to food packaging). Until recently, the garden centre chain Wyevale (now called the Garden Centre Group) offered a recycling service, but that’s now been dropped. That means only Dobbies, which has 26 outlets (mostly in the North of England and Scotland) and Notcutts (19 stores) will take them off gardeners’ hands. Some progress is being made – biodegradable pots (made from coir, for example) are now available, which some nurseries, like the Hairy Pot Plant Company, exclusively use. However, we have come across a ‘biodegradable’ plastic pot that not only can’t be composted in a domestic heap, it even contaminates recycling streams! That aside, the majority of plants are still sold in everyday plastic pots and the horticultural industry doesn’t seem to be doing much about it. There is some hope on the horizon. A company called Axiom Recycling is carrying out a pilot ‘bring back’ scheme at garden centres in the North West of England this summer. In the meantime, it looks like it’s up to us to say ‘no’ to plastic pots. Ask your local garden centre if they offer a recycling scheme, take your old pots to Dobbies if there’s one near you, and if you see a plant in a biodegradable pot, buy it. Is your shed overflowing with plastic pots and are you frustrated by the recycling limitations? Or have you found a clever use for your plastic pots that you’d like to share? I very rarely buy plants in pots – too expensive. I buy seeds and grow them on starting with seedling trays – transplanting to larger home “recycled” pots that I’ve had for years (actually bought 30 years ago as new empty plant pots) – it’s more interesting that way. So my plant pots numbers are static – the number broken is minuscule. Very occasionally I’ve bought a plant in a fibre pot which is planted with the plant and degrades. But I’m talking at most four plants a year. Like Richard, when I grow plants I use seedling trays, so rarely buy plants in pots. But this left me in a huge dilemma when I had just started gardening, and had accidental success – I had loads of seedlings but hardly any pots to put them in. If anyone else finds themselves in this situation, I thoroughly recommend freecycle – I put a shoutout on freecycle and was inundated with people nearby who were in the same situation as Veronica – lots of pots and nowhere to put them! I then fill them with standard bedding plants and fushias (both trailing and bush) – It makes a really spectacular display from spring to autumn. It has a superb added advantage in that my three very large – very clumsy – and very fast dogs can chase “invaders” or themselves to their heart’s content without damaging the flower beds.- the amount of damage to the window boxes has been minimal. Cats no longer pop into my garden to dig and leave “presents”. One last advantage is I can leave the flat part of the garden to the insect foodplants that help the ecology.- the amount of insects birds and mammals present in the garden show they appreciate the gift. I think this is partly related to recycling and packaging. Do without if you can, be parcimonious with them if you can’t do without them, freecycle if you can, or recycle if you get overwhelmed. We run a recycling plant in Essex that only recycles pots ( poly propylene ) and trays ( polystyrene ). The process involves us cleaning and granulating the pots and trays. This is then sent on to plant pot and seed tray manufacturers. Essentialy this is a proper closed loop recycling model. 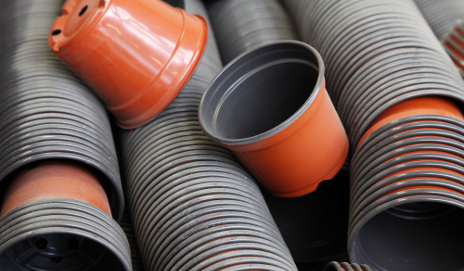 All your plant pots and seed trays can be recycled – no problem! The problem we have is actually that we cannot get enough of the pots and trays to operate in a profitable way. The other issue is that the pots and trays that are dropped off at garden centres are loose and therefore incurr high haulge costs. We are looking at the possibility of using a commercial bin lorry to collect and crush on site? If you have any pots and trays or fabulous ideas we would be pleased to hear from you. I belong to a residents association and I know of another close by, and the majority of members are gardeners. I think that this could be a good network from which to spread by word of mouth a scheme to collect twice a year from designated collection points. I too have a collection of pots which I can’t bring myself to put in the bin. I work in a garden centre in Kent and we have 100`s if not 1000`s of plastic pot trays, that we have stored desperately trying to find someone to take them away for recycling so they do not end up in landfill. Can these be recycled???? Does anyone want them?? that are overflowing In my shed. We now need the space for other things. Your letter was in 2011 you are probably no longer recycling pots but I thought it worth a try. It now being 2014! One thing you can do with your unwanted plastic flower pots is to give them away to people like me, I will be more than happy to take them off you any sizes or colours. I started a new hobby early this year – growing plants in containers and I am always running out of pots. I would be very grateful if you can send them to me and I can assure you that these will be put into good use, especially this time of year! I look forward to receiving them from you soon. Although I have far too many small round pot, flimsy types etc. and freegle them, I still buy deep and/or square pots, or large pots for plants that will need them for several years. Now “Wyevale” only sell biodegradable standard pots. Useless to me if I don’t know if they will outlive the plants, and can’t be reused. Would you want a 20-30 year old treasured plant to fall apart when you pick it up? All biodegradeable pots should be indelibly marked and dated with a use by date to be of any use to serious growers. I would also like to add that we are a recycling company based in the south west of england, we recycle plant pots and the trays and need as many as we can, If any company wants to send them to us we will recycle them all. Hi.. We would love to send you our old plastic pot trays and old flowerpots. The problem is logistics of getting them to you! We stack the trays in type piles so keep them as neat as poss, and they are in wooden crates so can be forklifted onto a lorry. Any suggestions would be great! We are in South east Kent. Hi, I have just seen that your compant recycles plant pots. Where in the South West are you? I’ve got loads and would love you to have them! I have thousands of used pots – square and round – from 9cm up to 25 litres. If you want to recycle them, all you have to do is put some contact details here – I’m sure you will get all the pots you need delivered to your door! From my work with a UK based R&D company I can confirm that an EU funded project is underway to recycle unsorted mixed waste plastics into a very usable product. However, I am also a firm believer that bio-degradable plant pots and trays will eventually replace plastic and polystyrene plant containers. I am currently involved in researching the viability of this switch to alternative mouldings made from powdered bamboo, rice husk and corn starch. The UK commercial growers and retailers I have spoken to are willing to switch at least some of their purchase to a bio-degradable alternative but as always – subject to price. These containers can be produced to bio-degrade in weeks, months or years and a perfectly safe. This material can even be used to produce plates, mugs and animal bowls and is certified safe for human use. If any growers or retailers are interested in assisting me with this research please make contact. I found your comment very interesting because recycling is never going to be as effective as replacing the plastic with degradable materials. The difficulty I see is how garden centres will cope with daily watering of slow-selling plants in pots that will be degrading in front of them. Could you keep me up to date with your progress please? My local council (Malvern, Worcs.) sends all plastic to landfill. Are you sure that this is different to food packaging? There is certainly a lot of see-through PP food packaging – and household bottles around. My New Year’s resolution (well one of them) has to be to grow my own herbs again. The ones from the supermarket are not in biodegradable pots, do not very often live long and are far too expensive. Hi. everyone, today 08.02.18 I called Wyevale and Nottcuts and neither take in used pots now. We are based in staffordshire and we recycle plant pots, and lots more at decorative garden products, we coat them with a aggregate and then sell them on. Have a good day to you all. I would like to know the information about plastics vase. I put three vases overlay by planning for a long time. I want to take off two vases now but it can’t take off anymore and root are steadiest to three vases. Please, kindly guide me how to take off that two vases.